View from the breakfast table. The fig tree is sprouting leaves and I think that they look like enormous butterflies ready to lift off and fly away. They stretch eagerly towards the light. This corner of the world, and our garden in particular, is full of life and the promise of things to come. Some days, especially when the sky is blue and the sun warm on my back, I ache with the beauty of it. The friendly wisteria vine that grew in through the hedge from the neighbour's garden is thriving. It has latched onto the garden shed and we're training it to go where we want it, across the front of the roof. So far it's cooperating beautifully. The slightest stirring of air sends sweet fragrance through the garden. How do you store your food containers? I kept mine in a set of double lower cabinets, but found that I only used the ones in the front because reaching to the back was such a chore. Some day we'll redo our cabinets, but for now, Tim installed drawers behind the cabinet doors. It took a couple of evenings and he had most of the supplies already in his shop. I'm loving the ease of access and how organized it all is. A great gift! a succulent in a French-inspired pot along with some chocolates another. There's also a hanging pot of fuschias on the front porch. Miss A made this delightful pipe-cleaner portrait of her Nana, from Nana's favourite colour, blue (also Miss A's favourite). It makes me giggle to look at it. So very cute. Today was such a beautiful day, wasn't it? Your gifts were so thoughtful - and love the portrait of you. And the drawers - wonderful. We had sliding drawers installed several years ago and things are so much easier now. I always look at the modern kitchens with only drawers and no lower cupboards and wonder why it took us so long to figure it out. Our son-in-law installed our drawers in the lower cupboards and I don't know what I did without them before. We store the pots and pans, potatoes and onions, tupperware, breakfast cereal, baking dishes, bread pans, two sets of vintage dishes, snacks and more in the different drawers - simply fabulous. Your fig tree does look like butterflies and the flowers are spectacular!!! Happy Mother's Day and a happy week ahead. Love the pipe cleaner image of you! I am always delighted by art from littles. Love these big drawers in kitchens instead of just a cupboard with shelves. So much more useful and easy to navigate! Happy Mother's Day to you! You make me so anxious to get outdoors and start to work on spiffing up my patio and garden beds. I'm not going to rush as I want to keep it simple this year. We have a ton of concrete and landscape work in the front so I'm narrowing down my focus to the big backyard! My wisteria hasn't bloomed yet this season but it is taking over everything! Thanks for the tip on the storage containers. I think drawers are a wonderful idea. I'm going to do some serious organizing. Lovely gifts, the plants and flowers are just perfect. Aren't we so fortunate Mother's Day is in the spring? Have a wonderful week, Lorrie! Those tree leaves do look like butterflies and the traveling wisteria is so pretty! This prior owner of my house had sliding cabinet drawers installed in all the kitchen cabinets. I find it so easy to find things and organize because of it. Love your Mother's Day Gifts--especially your pipe cleaner image--so cute! Love your storage solution for the containers. I usually stack them, but in my pantry. How nice to have such a friendly neighbor and such a pretty one at that. I can only imagine how lovely she smells. Your Mother's Day gifts are so thoughtful. I think you are going to love your pull out cupboards. We went that route when we built our house and I have never regretted it. Makes it so much easier to get to the backs of those cupboards. I am thinking that Miss A's gift may be the one that brings the smiles on for many years to come. So sweet. Lorrie, The wisteria is absolutely lovely. Wish I could smell them. Some nice gifts for Mom's Day. Have a great day! Sylvia D.
I understand your feeling of aching with the beauty of the garden. Those drawers are perfect! I struggle with having to get down on my hands and knees to get into the back of some lower cabinets! What a great solution! That pipemcleaner nana is great! You either have super long hair or rabbit ears! Darling gift from your sweet grand! Its a treasure! What a good idea the drawers are, so much easier. I think you will treasure the pipecleaner for a long time! The wisteria is gorgeous. I hope it isn't removed by the owner as it would be the end for your enjoyment of it. 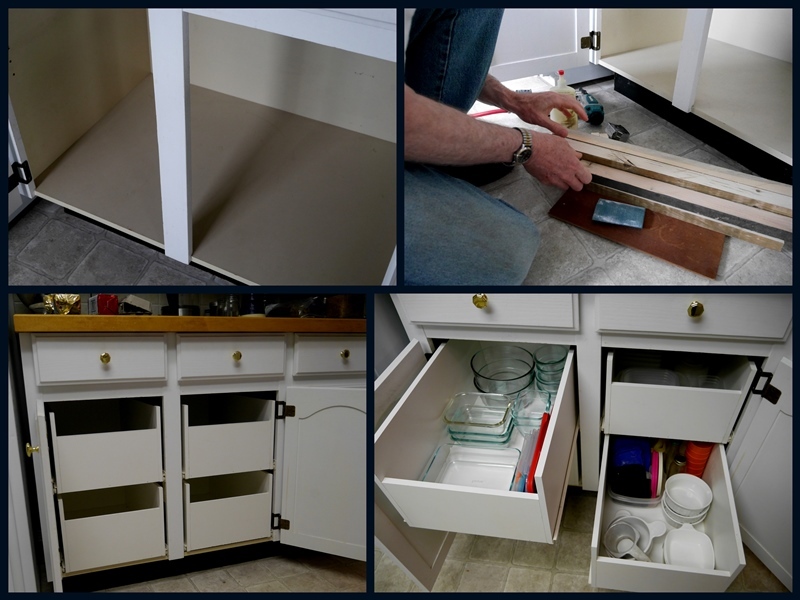 That is wonderful of your hubby to make the slider drawers for your cupboards. I have them in one section and love them. They are so practical. The roses are so pretty and such a soft colour. Have a great week Lorrie. Oh my! Look how beautiful you are...so thin and soft and blue! I love it too! These are the things I keep forever! Love your pretty flowers! Enjoy your day! The fig leaves are wonderful! Mine came out so long ago, probably when it was rainy and cold, so that I couldn't enjoy them quite the same way. Those Mother's Day roses are gorgeous, too. I'm glad you had a wonderful Mother's Day weekend, Lorrie. Your granddaughter's pipe cleaner version of you made me chuckle too. Too cute! Your hubby did a great job with the drawers. Your pipe cleaner sculpture is the dearest thing!! I love the conversion of your cabinets into drawers-behind-doors. A lovely and thoughtful gift from your hubby. How wonderful to have a fig tree. One of the most beautiful, IMO, and one of the tastiest fruits. I'm glad you had such a nice mother's day. Lucky you to have your neighbours wisteria invading your garden, it looks stunning. I love the one that we inherited so much, the perfume is so heady! So happy to know that you had a lovely Mother's Day, the roses and pot plant are both gorgeous but I know you'll treasure the gift from Miss A the most. Fabulous photos, Lorrie! The Wisteria looks gorgeous. Goodness, does it have double flowers? How do I store my food containers? Surely not as beautifully organised as you do. Perfect Mothers Day ...lovely gifts with the blue portrait the best of all of course ! Wisteria makes me homesick...hope our daughters is still blooming when we get back across the country. We 'built' an IKEA kitchen here in Florida and have lots of drawers instead of cupboards ...the only way to go IMO. Apparently wisteria will grow here but has to be a certain variety and I've never thought of the scent - what is it like? My containers are in a top cupboard and I really condensed them to just a few. I once bought a huge box from Costco and ended up giving them away. Isn't it nice when a hubby is handy and can build us things in the kitchen? I love the sliding drawers. What a wonderful idea to install the drawers behind the cupboard doors, Lorrie. That sure makes storage much more convenient. Your roses, the succulent are so pretty, but I do love Miss A's pipe cleaner creation is so dear! It sounds like you had a special Mother's Day. Happy belated Mother's Day, Lorrie. Such gorgeous roses! The wisteria is gorgeous. I can just imagine the soft scent that the wind stirs. Love the drawers behind the cupboards. Very smart! That wisteria is gorgeous ... glad you had a nice Mother's Day, I think the pipe cleaner doll is just so sweet. Oh that wisteria is just gorgeous. I love the idea of drawers versus just shelves for exactly the reason you stated. Such a fantastic solution! Oh, and I meant to comment on those drawers built by your hubby... wonderful way to make that space more easily accessed. I have my containers in one very large drawer that sits below my double ovens. I like that yours are four smaller drawers because with 5 adults (and 3 of them males) my drawer needs straightening at least once a week!